I expected something wonderful. The $630 Samsung Sound+ has eleven drivers, wi-fi audio capabilities similar to the slightly more expensive Sonos Playbar, and a very attractive design. In short, I was hoping for a cheaper version of the Sonos Playbar, and in many ways that’s very much what you get, particularly if you’re using a Samsung TV, which it magically pairs with. Yet a slightly lower price tag than the competition comes at a significant ding to audio. This thing did not fill my home with music or explosions. Instead it just offered a decent upgrade to the dinky speakers on my TV. It’s very easy to buy a cheap sound bar for an okay audio upgrade. Vizio makes a wide range of bars that are a meaningful sound boost for most televisions—even if the bars themselves look kind of lame and are supremely fussy for the average TV owner. If you want to upgrade from there, it usually requires a major investment, skipping from the $100-$300 range and jumping straight into the $700 and up range, where great bars from Sonos, Yamaha, Sony, and others reside. The Sound+ HW-MS750 sits in that range too (its 9 driver $430 Sound+ HW-MS650 cousin sits in a funkier spot). But when you leap in price like that you should expect a big improvement in sound. Can be fussy on non-Samsung TVs, and audio sometimes sounds muddy. 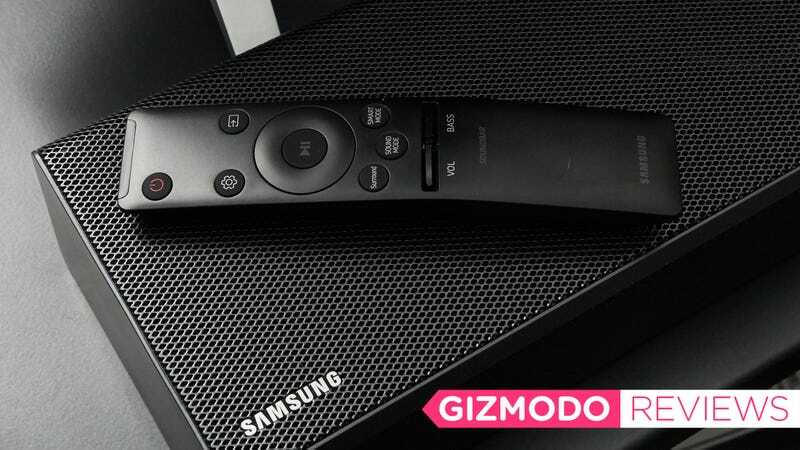 Unfortunately, the Samsung Sound+ is a half-step between a simple upgrade to your TV audio, and fully embracing fancy home theater setup. It’s got five channels of sound out of the box coming from 11 drivers, each powered by its own amp, which means this thing can put out a lot of power, but for five channels of sound pointed at my head I hoped for a lot more sense of space. When David Bowie started singing “Life on Mars?” I couldn’t hear a distinction between his voice and the piano that I would have preferred. While music sounds way too muddy for the price, it still has moments where it surprised me. While playing Destiny 2, I could hear the crunch of feet on gravel as bad guys tried to sneak up behind me. Explosions had a satisfying impact, thought they lacked rumble since the bar doesn’t ship with a separate subwoofer. The internal subwoofer is supremely middling. While testing less challenging audio sources, like Netflix’s Mindhunters, the Sound+ remained clear when handling all those different voices. Buttons on the side let you control the bar if you can’t find the remote. If you’re tired of the crummy sound from your TV or the barely-there upgrade of a cheap sound bar, then you’ll appreciate the way the Sound+ handles audio, despite its drawbacks. It almost sparkles—and that excellence in the mid- and high-end areas means the audio can still envelop you, even if it doesn’t set deep in your bones like it might with a bar with better bass. There are a ton of ways to connect to the Sound+. Sadly, it’s just too pricey for the user experience. When I had it plugged into my Vizio P-Series TV I was constantly reaching for the remote. Sometimes to switch the audio setting, sometimes to adjust the volume, other times to turn the speaker on when it would power down before the TV. Compared to the slightly pricier Sonos Playbar, itself a wireless audio soundbar solution that can be upgraded with additional speakers over time, the Sound+ just doesn’t pass muster. The Playbar is so easy to set up it feels like magic. There’s only one input beyond wi-fi, and the Playbar automatically attunes to your primary remote. The Sound+ has more options, including analog, HDMI, and Bluetooth, but setup requires more work, a comfort with the included remote, and it’s only truly magical and easy if you already have a Samsung TV. The only place the Sound+ excels against Sonos or other wireless audio sound bars is in the price department. This bar is pretty cheap for the features included! If you don’t mind paying more than $630, you can tack on two additional wireless speakers ($180) and a subwoofer ($500) for genuine 5.1 surround sound. That’s about $1,310 for a wireless 5.1 home audio solution. To do the same with Sonos, the best wireless audio solution at this point, would cost about $1800. If you already have a recent Samsung TV then it’s a no brainer, the Sound+ is an upgrade for all but the priciest Samsung sets. 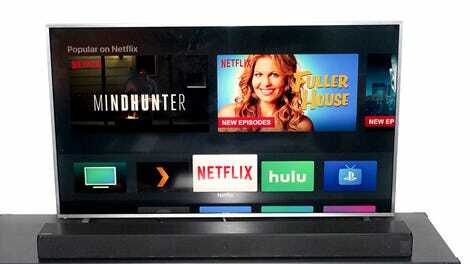 But for most people, you should consider something cheaper or save another $70 and grab the Sonos Playbar. Because if you flop on the couch and want nothing more than to hit the power button and not think, then the $630 Samsung Sound+ is a pass. This is a good sound bar, but the Sonos Playbar is a whole lot better. Powerful 5-channel speaker that handles your talky TV drama well. Audio isn’t as clear as it could be. In busy scenes of films expect to lose a sense of space. At $630 it’s cheaper than the Sonos Playbar, another wireless soundbar that can be hooked up to a whole home wireless audio system. Sets up with minimal fuss on a Samsung TV, but requires some effort for TVs from other brands.